Manufacturer of a wide range of products which include cataract surgery set. Cataract Surgery Set offered by us feature a wide array of instrument options to precisely provide support as eye instruments used in small incision cataract surgery. The choices include. Dressing forceps and Fixation forceps. 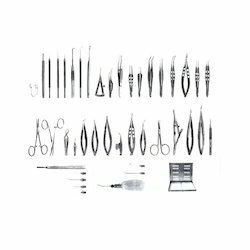 Here, we ensure that each of the instrument support provided in this set is precisely designed to support demands of performing eye surgeries. These cataract sets are offered to customers at competitive prices.